The single most effective safety device available to reduce head injury and death from bicycle crashes is a helmet? Their helmet should be comfortable and snug, but not too tight. It should sit centered on top of their head in a level position, and it should not rock forward and backward or side to side. The helmet straps must always be buckled snugly against their chins. 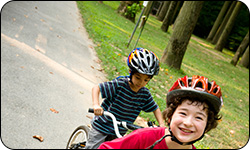 Remind them to ask mom and dad to make sure their bike's reflectors are secure, the brakes work properly, gears shift smoothly and tires are tightly secured and properly inflated. Ride on the right side of the road, with traffic, not against. Stay as far to the right as possible. Respect traffic signals, stopping at all stop signs and stop lights. Ride their bicycles on the sidewalk until they are 10-years-old. Don't ride a bicycle when it's dark, in the fog or in other low-visibility conditions. If riding at dusk, dawn or in the evening is unavoidable, they should use a light on their bike and make sure it has reflectors. Wear clothing and accessories that incorporate retroreflective materials to improve their visibility to motorists.